SUNGAIT is always devoting to offering Amazon users products with low cost but high performance. We supply with kinds of sports sunglasses, fishing sunglasses, driving sunglasses, running sunglasses and golf sunglasses for both Men and Women. 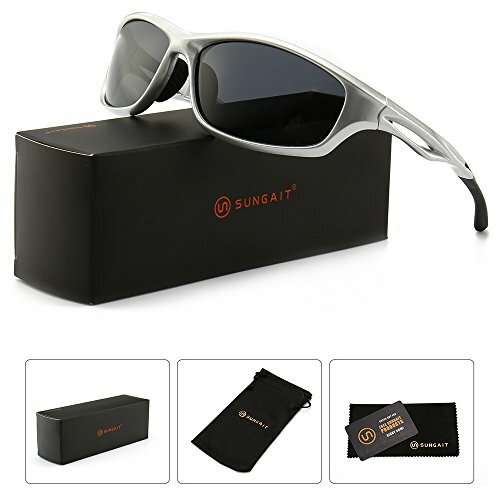 Buying SUNGAIT sunglasses, you could not only receive a quality product but also enjoy our exceptional customer service. • The Superlight TR90 frame: You can hardly feel them on your face, yet they are unbreakable! If you are looking for lightweight sunglasses, this one couldn't be wrong! • HD Polarized Lens: 100% UV400 protection lens blocks 100% Harmful UVA, UVB & UVC Rays. Best sunglasses/polarized sunglasses for Men and Women! • Fashion and Stylish: Fashion sports sunglasses with stylish color combos for your choice! • Superlight Sports Sunglasses: Ideal for Driving, Running, Fishing, Racing, Skiing, Climbing, Trekking, Cycling Bicycle, Motorcycling, Golf, Baseball and other outdoor activities. UNIQUE DESIGN-Combining the best of performance eyewear with versatile style, the Sunglasses have a clean, lightweight design and ventilation ideal for running, training, and beyond. HD POLARIZED LENS-HD Polarized lenses filter out 99% of reflected glare without the haze and optical distortion that can come with polarized lenses made with conventional manufacturing techniques.